Eye/face wash with six aerated sprays and rectangular stainless steel bowl. Eye/face washes provide six aerated sprays for gentle yet thorough rinsing of the eyes and face. Featuring an in-line strainer, the washes have a stay-open ball valve and a large rectanctular bowl. 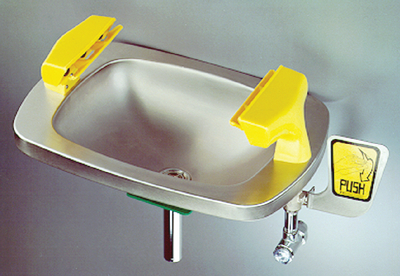 Eye/face washes are available with wall or pedestal mount.